Confronting ISIS A peshmerga fighter—with an American patch on his left arm—stands near the southern Kirkuk front line, in northern Iraq. Last October, I arrived in Amman, en route to Baghdad, on the day Michael Zehaf-Bibeau shot and killed Corporal Nathan Cirillo at the National War Memorial, in Ottawa. When I watched the footage and heard gunfire echoing through Centre Block’s marble halls, I was sitting in a hotel room in the Jordanian capital. It was an interesting moment for a Canadian reporter to be in the Middle East: Canada was at war in Iraq, having sent six CF-18 Hornets there just the day before. As George W. Bush’s administration had done in 2003, Stephen Harper’s cabinet was listing off reasons to send troops even as boots were arriving on the ground. Three months after Zehaf-Bibeau’s attack, the PMO put out a jingoistic video—a montage of the cenotaph and the gunfight on Parliament Hill that included a Royal Canadian Air Force pilot punching the air, presumably after a successful mission. The takeaway: Avenge Corporal Cirillo. Bomb ISIS. Zehaf-Bibeau himself claimed he was acting in solidarity with targeted groups in Iraq. “Canada’s officially become one of our enemies by fighting and bombing us, and creating a lot of terror in our countries, and killing us and killing our innocents,” he declared in the cellphone video he recorded shortly before stepping onto Wellington Street. Yet the thirty-two-year-old was a troubled, mentally unbalanced man who had converted to Islam late in his short life. It is hard to say how much of the so-called Islamic State of Iraq and Syria’s belief system, if any, he actually understood. At the heart of that system is the Arabic word takfir, describing the practice by which one Muslim pronounces another guilty of apostasy—typically considered a capital crime under sharia. Until recently, many Islamic scholars taught that only the leaders of Muslim states had the right to practise takfir. In the theological free-for-all of today’s Middle East, however, what defines a state, and even a Muslim, is increasingly unclear. From an insurgent checkpoint, Ali and I were taken to Fallujah’s central mosque, which the anti-American forces were using as their headquarters. There we got a good look at the insurgency—a mix of tribal sheiks and former members of Saddam Hussein’s Baathist regime. These were the leaders of Sunni society in Anbar Province, the vast swath of desert that today largely is controlled by ISIS. The most intimidating insurgent in the room, a man visibly hostile to us, had an Abraham Lincoln–style beard and wore his white dishdasha (a traditional, loose-fitting garment similar to a robe) above his ankles. When he began asking questions, my limited Arabic helped allay his suspicions. It might even have saved my life: a short while after we escaped, thanks largely to some fast talking by Ali, the local takfiri released a video of the beheading of a young American, Nick Berg, who had been recently kidnapped. Only then did I suspect that my interrogator probably had been a member of al Qaeda in Iraq, or AQI. The calculated violence employed by the takfiri assures them plenty of attention in the Western media. Yet they are, by my observation, a slim and highly unpopular sect within Sunni society. How, then, are a few thousand ISIS fighters capable of occupying large areas populated by millions of Iraqis? As Canada continues—indeed, escalates—its war with ISIS, politicians and policy-makers need to grapple with that question in a serious way. But based on its public pronouncements thus far, there is little evidence the government’s analysis has gone much beyond patriotic slogans and images of pumped-up fighter pilots. From Amman, I flew 800 kilometres to Baghdad with a contingent of Iraqi politicians who represent the country’s Sunni parties—players who mostly had been shut out of power by former prime minister Nouri al Maliki, a member of the Shiite majority. Our plane headed east across the desert and then cut south to avoid the ISIS stronghold of Fallujah. Much of Anbar’s airspace was closed, just as it had been when I lived here in the mid-2000s, and for the same reason: a Western air force was bombing Sunni militants. It was almost a decade to the day since US Marines had made their second attack on Fallujah in what was supposed to have been a final victory. By the time the US withdrew its troops in 2011, some 1,300 Americans had been killed in Anbar alone—roughly ten times the number of Canadian deaths in Afghanistan. Jean Chrétien’s Liberal government declined to contribute forces to Bush’s war. Most Canadians believed this was the right decision. Pentagon planners had counted on a grateful Iraq transitioning to a peaceful, pluralistic democracy following the removal of Hussein. Instead, it fell into violent chaos and then full-fledged civil war. AQI was especially bloodthirsty, setting off improvised explosive devices in Shiite areas and turning on fellow insurgents who opposed their radical methods. It was beaten back only after the US military entered into an alliance with formerly rebellious Sunni tribes in 2006 and 2007—a process described as the Anbar Awakening. Washington viewed that gambit as a turning point in a war it hoped would soon come to an end. But Anbar would explode again eight years later—this time under the Black Standard of ISIS. To understand how this happened, one must consider Iraq’s complex demographics. While Sunnis and Shiites have been fighting each other on and off for fourteen centuries (a theological schism not unlike that between Protestantism and Catholicism, which has itself caused conflicts throughout history), relations between the two groups in Iraq once were relatively peaceful. That ended in the late 1970s, with the rise of Hussein, a Sunni dictator who banned many Shiite religious ceremonies and ruthlessly put down a Shiite uprising in the shadow of the Gulf War. After he was deposed in 2003, the country’s Shiite leaders claimed power by sheer force of numbers, effectively creating a tyranny of the majority, rather than Washington’s hoped-for pluralism. As the American presence in Iraq dwindled, Shiite militias—backed by Iran—took their revenge for what they had endured under Hussein. From a Sunni point of view, the US occupation simply was replaced with an occupation run by Tehran’s proxy armies. The resulting fury explains why many Iraqi Sunnis have welcomed ISIS forces, which swept into the western part of the country in 2014, out of the chaos of Syria’s civil war. The Iraqi Army fled, leaving behind several divisions’ worth of equipment, as well as money in the bank. A caliphate was born, and with it the possibility that larger and larger swaths of the Middle East would join takfiri mafias whose camera-toting executioners disseminate propaganda snuff films of beheadings and live burnings. This was an enemy everyone could hate. The West could again make an argument for war in Iraq, which might be just what ISIS wanted. And this time, Canada joined in. Exactly why the Iraqi military, having been trained by US forces to the tune of $25 billion, melted away is hard to fathom from the outside. The US military generally is competent at training proxy armies: it’s how America has maintained a global reach for the past century. The disintegration of two divisions in this part of the country had less to do with inadequate training or Western withdrawal than with politics in Baghdad and the way Maliki proceeded to run both his country and his army. According to one local general—a man who had worked with US Army generals David Petraeus and George W. Casey Jr.—the development of Iraq’s military originally was conceived as a long-term, multi-step program that would extend to 2024. At the time Barack Obama pulled the remaining American forces out, that process still was at an intermediate stage. There were plenty of Iraqi men in uniform, but there was little in the way of a disciplined, professionally organized, well-supplied fighting machine. What’s worse, Maliki used his army in Sunni areas, including Mosul, as a virtual occupation force that divided towns with blast walls and checkpoints. Stories spread of soldiers arresting Sunnis under false pretenses or demanding bribes. Baghdad cut off the Sunni tribal groups that had joined with the US to fight al Qaeda, used de-Baathification laws to sideline much of the Sunni elite, and sentenced many Sunni men to indefinite detention under Article 4 of the country’s anti-terrorism law. With the Americans gone, Maliki gave command posts to his cronies, whom he could control. These men had little military experience and, for the most part, used their positions to generate income. In 2013, as the tribes in Anbar began bristling more openly against Baghdad, Maliki deployed the army to quell protests—sometimes with violence. When ISIS appeared shortly thereafter, according to the Iraqi general I interviewed, incompetent commanders made basic strategic errors that demoralized the rank and file. They would, for example, deploy tank units when infantry was needed, or vice versa. By the time ISIS militants attacked Mosul, once the country’s second-largest city, in June 2014, soldiers no longer trusted their officers. Most fled at the first signs of danger, which were amplified by gruesome propaganda. According to some reports, ISIS planned merely to storm Mosul’s prison. It ended up capturing the whole city. Much of the young caliphate has come about by accident. Westerners primarily know ISIS from its beheadings of terrified hostages, its appalling acts of violence against minorities such as the Yazidis, its attempts to recruit Western Muslims through social media, and its destruction of cultural artifacts. But among the many Sunnis who inhabit areas the militants control, the view is different: ISIS is the lesser of two evils. From Baghdad, for instance, my translator and I called a professor in Mosul—which has a reputation for being a conservative and somewhat snobbish city—to see what caliphate life was like. His biggest concern seemed to be that ISIS fighters had expropriated a neighbour’s house and were living in it with their chickens. What many in Mosul fear most are Shiite militias and Kurdish forces coming to liberate them. Even the Sunni exiles who were driven out of Anbar by ISIS sometimes view the group as a preferred alternative to the central government in Baghdad. When I still was in Amman—a city full of powerful Sunnis who’ve removed their families and money from Iraq—a friend introduced me to one of these men, a wealthy business person from Anbar who recently had lost two large factories to the militants. As we talked, the local television stations were reporting the massacre of dozens of tribal fighters. The man explained that, notwithstanding the amoeba-like daub marked “ISIS” appearing on cable-news maps, the group’s control is limited to a patchwork of areas where they are allied with local tribes. (Some of these tribes had been waiting for the central government to supply them with arms, as the Americans had done during the “awakenings”—but the government feared that weapons would end up in the wrong hands.) Much of the fighting against ISIS is done by Shiite militiamen wearing green sectarian headbands. They are trained in Iran and often directed by Iranian generals. They, too, execute civilians—sometimes in gruesome ways involving electric drills. But unlike ISIS, they don’t often film themselves doing it. My new acquaintance made an argument you hear frequently in this conspiracy-oriented part of the world. The Americans, he noted, released ISIS leader Abu Bakr al Baghdadi from prison two years before former AQI leader Abu Musab al Zarqawi was killed. The implication is that the US is the driving force behind the Islamic State, perhaps using it as a way of getting at Iran, or a means of keeping Iraq divided, or an excuse to re-invade that country. These widely held views are not often reported by Western journalists, because they sound silly. Many Canadians view the current intervention in Iraq as a noble enterprise aimed at ridding the country of a ruthless and barbaric paramilitary group. That is not how our effort is viewed by much of Iraq’s Sunni population, which has endured years of oppression. Wasn’t the man angry about the loss of his factories? No doubt he was. But he also saw an upside: “I was sorry for five minutes. Then I realized it was for the people”—by which he meant his fellow Sunnis. What would happen if he returned to Anbar? He shrugged and said that ISIS would kill him. Later, I visited with Mohammad Bashar al Faidhi, spokesperson for the Association of Muslim Scholars in Iraq. The word spokesperson suggests Bashar is an accessible mouthpiece. But his association is a shadowy group; its members comprise the spiritual leaders of the original anti-American rebellion in Anbar. Back then, US officials were forbidden to speak to them. Bashar is from Mosul, where ISIS’s destruction of “blasphemous” shrines has provoked international outrage. He also is a Sufi, part of a mystical branch of Islam that takfiris view as an especially repugnant form of apostasy. (If captured by ISIS, you’d probably be better off to say you were a Christian than a Sufi.) Bashar has spoken against the group publicly. He, too, would be killed if he returned home. A Sufi with a price on his head seems a likely champion of Western efforts to bomb ISIS. Yet Bashar spent much of three hours outlining how it was the Americans who effectively had done the seed work for them by invading and occupying Iraq in the first place. The group was just the latest manifestation of al Qaeda, he said—but more insidious because many of its members had been imprisoned and tortured. The movement has become the vehicle of their revenge. It is unclear whether a retrained, effective Iraqi military could take and hold Anbar Province and Mosul without local consent. According to a United Nations diplomat I met in the region, the bare minimum for the alienated Sunnis to buy back into the country would be not just the repeal of Article 4 of the anti-terrorism law, but the reversal of the de-Baathification process first implemented by the Americans. There would also need to be amnesty for Sunni nationalist militias who resisted US forces. These militias—not the cadres of foreign fighters whose sensational stories we hear about on the nightly news—are the real backbone of ISIS in Iraq. Perhaps the best way for Canadians to think of ISIS is not as a new virus sweeping across the Middle East, but rather as a pathologically severe immune-system response among aggrieved Sunnis. From their point of view, this response has paid at least one major dividend: in large part thanks to the deteriorating security situation, the Americans and the Iranians finally grew sufficiently exasperated with Maliki to push for his ouster. Almost everyone involved agrees that this was a necessary component of any large-scale plan for ending Iraq’s lengthy civil conflict. Notably, this step was achieved not through bombs but through diplomacy. Maliki was replaced in 2014 with a more Westernized politician from his own Dawa party, Haider al Abadi. His rhetoric is not as harsh as Maliki’s, and he appears to understand the alienation of the Sunni minority. But Maliki, who is now a vice-president, still wields a lot of power; Abadi himself has little control over the Shiite militias fighting ISIS. So far, none of the overarching Sunni demands have been met by Abadi or by Iraq’s parliament. There has been no general pardon, and Article 4 remains on the books. Line in the Sand Peshmerga forces on the frontier between ISIS- and Kurdish-controlled territories, in July 2014. After entering Baghdad in an armoured convoy, one of my first visits was to the deputy prime minister, Saleh al Mutlaq, a powerful Sunni politician (although he represents a party, the Iraqi Front for National Dialogue, that nominally bills itself as non-sectarian). He hopes to fare better than some of his co-religionists who have taken leadership roles since Hussein’s overthrow. For instance, the day after the Americans pulled out, a previous Sunni vice-president, Tariq al Hashimi, was charged with terrorism and sentenced to death; he is now in exile. In a Baathist-era palace, decorated in the gold-leaf style known as Louis Saddam, we were ushered into a marble room with two large thrones. One of the legacies of the American occupation is the opulent isolation of the Iraqi political elite in the former Green Zone, where they live like oil barons while much of the population struggles to survive. Despite the military crisis in the north and the west—or perhaps because of it—Baghdad is bustling. For the well-connected, money floats around like the dust that coats the city in a fine yellow powder. Mutlaq walked me up and down the long room the way an Oxford don might take a confused freshman for a stroll. He had one of those spectacular noses Daumier would have loved, and it seemed to direct us thoughtfully down the row of gilt chairs. For politicians such as Mutlaq, caught between Sunni extremists and Iranian-backed Shiite militias, a refurbished army is his country’s only nationalist hope. Foreign intervention can, at best, slow ISIS while a compromise between the political parties is hammered out and the military regroups. In the meantime, it is an open question whether mainstream Sunni politicians who do business in Baghdad have any real influence in the alleys and date groves of the hinterland. I was curious whether he thought the Syrian conflict could be separated from Iraq despite ISIS’s self-anointed caliphate spanning both sides of what once was a meaningful international border. He insisted that separation was possible. Syria is a regional war, with Russia and Iran backing Damascus against proxies supported by surrounding Sunni Arab states, including Saudi Arabia and Qatar. When it comes to wanting a stable Iraq, on the other hand, the West and the Saudis and even the Iranians all are on the same side. There is some sense of unity in Baghdad too: “Since Maliki has gone, there has been a real desire on the Shiite parties’ side to do something”—although, again, little has happened so far. He estimated that getting the army ready to take on ISIS would require about a year. Many US observers have suggested a much longer timeline. But as I write this, several months after visiting Mutlaq, Iraq’s military—or at least Iranian-supported militias allied with Iraq’s military—has managed to score local successes against ISIS positions (most notably in the city of Tikrit, which largely was cleared of Islamic State fighters in April). The next day, I was in my hotel garden listening to an official from the Ministry of Defence explain the rise of the Islamic State, then some forty kilometres away. Around us, members of the city’s nouveau riche were sitting poolside with their families. African waiters with accented English (and no Arabic) served alcohol-free drinks and kept the narghiles lit. The patrons mostly were Shiite. It was a beautiful fall night. The fresh desert breeze had blown away Baghdad’s prison air. Then a car bomb exploded down the road. Just before it went off, the official was partway through an account of how a third of Iraq had collapsed. He had reached the bit where AQI, beaten down by the tribal awakenings during the American surge, in the last years of the Bush administration, heads off to Syria to morph into what we now know as ISIS. The explosion—the kind of sound you feel in your chest—rolled over the garden and halted the official mid-sentence. My translator thought for a moment that it was a sonic boom, perhaps from a jet hunting for $10,000 Toyota Hiluxes with $100,000 missiles. Everyone around the pool put down their narghiles, picked up their phones, called to see if loved ones were okay. Then they went back to smoking. Upstairs, from my room, I could look across the toothy date palms, past the hotel’s inadequate blast walls, to the bored Tigris looping though the city. If you’ve spent time in Baghdad, it can be difficult to watch a movie that supposedly is set there—The Hurt Locker, say—because the stand-in locales never quite capture the city’s cinematic qualities, nor do they evoke its edgy sense of dread. The safer shooting locations of Amman and Tangier aren’t sinister or gritty or majestic enough. With its endless sprawl and smoky orange sunsets, Baghdad feels more like a film-noir version of Los Angeles. My first experience with the Iraqi capital was under Hussein, in the fall of 2002. By the following summer, when I was commissioned by a New York magazine to write about the terrorists (as they usually were described) who sporadically were attacking American soldiers, it was almost a different planet. In those first few months, I had become friends with a young sheik. He was from a small village between Ramadi and Fallujah, which I would visit after the US invasion. We swam in the Euphrates and stayed up late talking in the garden, drinking endless cups of tea with his many brothers and half-brothers. Eventually he agreed to introduce me to his cousins who were attacking the Americans, and I spent the next year getting to know some bad guys. They turned out to be far from the Baathist “dead-enders” portrayed in Pentagon briefings. In fact, they later would become the backbone of the tribal awakening that allied with the US Army to beat AQI. In the process, these bad guys went from terrorists to insurgents to concerned local citizens. Until—under Maliki—they went back to being terrorists. I gathered plenty in the way of material, but the magazine that had commissioned the piece refused to publish it. At the time, the notion of a wholesale rebellion in Iraq seemed absurd to Western editors, and my article was deemed alarmist and unverifiable. (This was around the time Christopher Hitchens was flying over Iraq in a helicopter with Paul Wolfowitz, pronouncing the project a success and accusing doubters of moral corruption.) My piece did find a place in Harper’s the following spring. By then, the idea that the country was heading toward civil war seemed less absurd. Today, you can read a great deal of solid journalism coming from Iraq—much of it by Iraqi reporters. But you’ll find little of it reflected in the public debate in North America, which often seems as simplistic as it did before the 2003 invasion. Defence minister Jason Kenney has described ISIS as a “genocidal terrorist organization.” There’s no doubt that it is a sociopathic mafia, but I am reminded that Saddam Hussein was widely described as “genocidal” only after he no longer was a useful Western ally. When Shiite militias carried out a campaign of torture, murder, and ethnic cleansing in Iraq that arguably was as deadly as the recent ISIS atrocities, politicians in the West generally kept silent. Never mind the many other species of evil unleashed following the invasion, not to mention the brutality of Bashar al-Assad, next door in Syria. 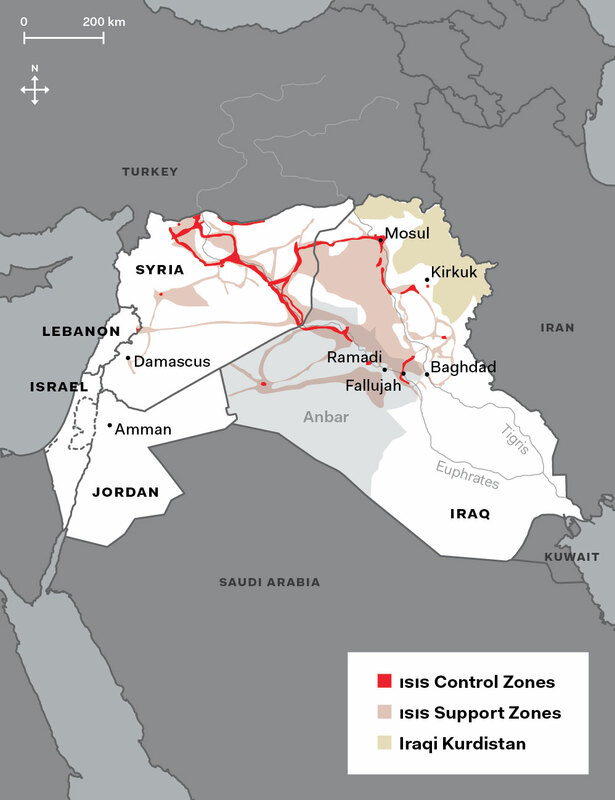 The stated long-term goal of ISIS is to create a caliphate that swallows up the whole of the Middle East. But what it really wants in the short term is attention, especially from the United States—the world’s only superpower and, therefore, the only enemy that can legitimize a terrorist brand as a truly world-class menace. Luring the US into open warfare was not difficult, especially after ISIS began executing American hostages. The group has a slick online magazine, Dabiq, named after a town in northern Syria. According to some traditions, that’s where the ultimate showdown between good and evil will someday take place. That fits with ISIS’s penchant for framing its campaign in absolutist, apocalyptic terms. But in Iraq, good and evil are sometimes hard to tell apart. Maybe that’s why Baghdad feels so noir. Mending Fences Blast walls in Saidiya, one of the few mixed Shiite and Sunni neighbourhoods left in Baghdad. What is Canada accomplishing in this war, which former foreign affairs minister John Baird called the “greatest struggle of our generation”? No doubt our six fighter planes and our six-dozen special forces have had some impact on ISIS, though it’s impossible to say how much. In purely arithmetic terms, our contribution is a rounding error in the overall order of battle: the United States is fielding more than 4,000 troops and an aircraft carrier–based strike group, along with drones and other high-tech weapon systems. But in at least one theatre of operations—the northern front, where Kurdish peshmerga troops have been pushing ISIS back from Kirkuk and other towns—Canadian advisers have made an impact. This contribution has not been without cost. On March 6, a member of the Canadian special forces, Sergeant Andrew Doiron, was killed, apparently by Kurdish friendly fire. The front lines were quiet when I visited last fall. This section of the front had been built up after ISIS captured Mosul the previous June. It looked like a real border post. A large metal canopy hung above a four-lane highway, offering protection from the winter rain. Mobile trailers to process refugees and house the Kurdish rear echelon lined the road. 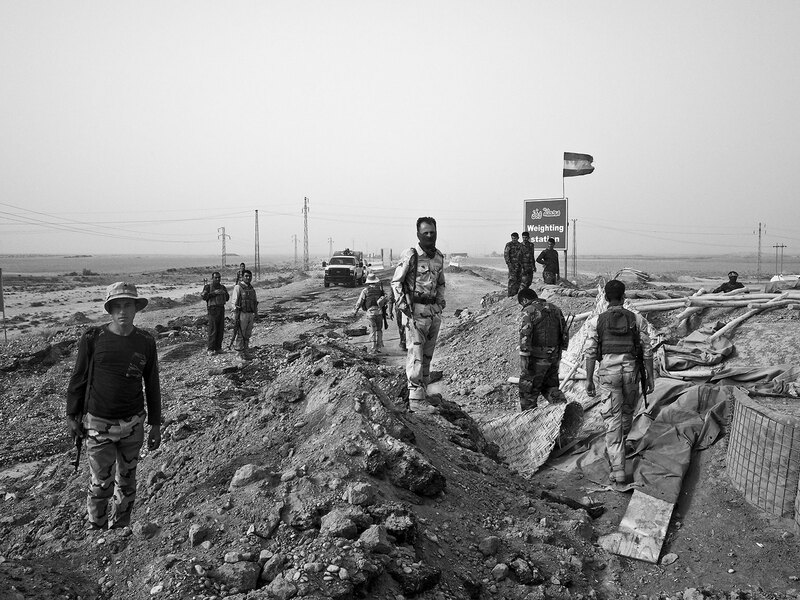 The highway still had signs for Mosul, thirty kilometres on, but the way was blocked by a series of dirt ramparts designed to stop suicide attacks, particularly by armoured garbage trucks stuffed with explosives—the ISIS version of a Hellfire missile. The Kurdish military retains the casual flavour of a guerrilla army. Even their baggy uniforms evoke the mountain heroics of their name, which means “those who face death.” The sentry enthusiastically welcomed me when he saw my passport. “Kanada!” he said, pointing to one of the trailers and assuming I was visiting the four Canadian soldiers stationed there, perhaps for lunch. In fact, I had an appointment to see some of the Kurdish officers commanding this part of the line. One reason Kurdish forces collapsed so quickly in the face of the enemy, they claim, is that Baghdad starved them of military equipment for years. Indeed, some of their present armoury did not come from the capital directly but was instead captured by ISIS after the Iraqi Army abruptly left Mosul—and was then taken by the Kurds following skirmishes with those same ISIS forces. There was a certain logic behind Baghdad’s reluctance to arm them. Following the ISIS advance, the peshmerga seized such disputed territories as Kirkuk, the symbolic capital of a dreamed-of Kurdish state, which is surrounded by equally disputed oil fields. A well-armed force, politicians in Baghdad and Washington have long reasoned, will inevitably lead to an independent Kurdistan. If this comes about, Canada will have done its small part to make it happen. In this part of the world, it is much wiser to speak of overlapping conflicts than to speak of any single conflict. After a while, the officers suggested we visit the Canadian soldiers. I was skeptical, but one of them picked up the phone in hopes of arranging a meeting. After a few moments, he put it down, a bit deflated. The Canadian advisers didn’t want to meet the Canadian journalist. This lack of national solidarity must have seemed a bit off-putting to those without a nation. So instead, the Kurds offered to take me closer to the front themselves. We went out to the SUVs, and I waited while they put an M16, captured from ISIS, in one of the cabs. We convoyed up the highway, which was pocked with IED holes, and passed the earthen barriers to a burned-out town, Hasan Shami, the home of Hussein’s former defence minister. Before retreating, ISIS had blown up the main bridge, which since had been replaced by linked pontoons. The houses, many of them booby trapped, were mostly ruined, their flat rooftops pancaked onto the ground, some destroyed by ISIS, others by vengeful Kurds punishing Arabs. I had not been in the area since 2002, when I spent a few days with a Yazidi family in a nearby village. Who knows what has happened to them in the decade since Hussein’s fall—a disaster for most of the “micro-minorities” that make up Iraq’s intricate mosaic of ancient cultures. If they survived the civil war and the car-bomb attacks carried out by al Qaeda, they might now be refugees from ISIS, their daughters sold at auction as wives for the group’s fighters. As we returned to the rear, a double rainbow appeared above brown hills still covered with the detritus of refugee encampments from the previous summer. Here and there, a solitary sheep fed on new grass. It reminded me of the idyllic scenes I observed while driving north from Baghdad in the fall of 2002, as armies waited for the winter rains to end and the fighting to get going that spring. Thirteen years later, it’s still going strong. Patrick Graham has published with the Guardian, the New York Times, and the Globe and Mail. 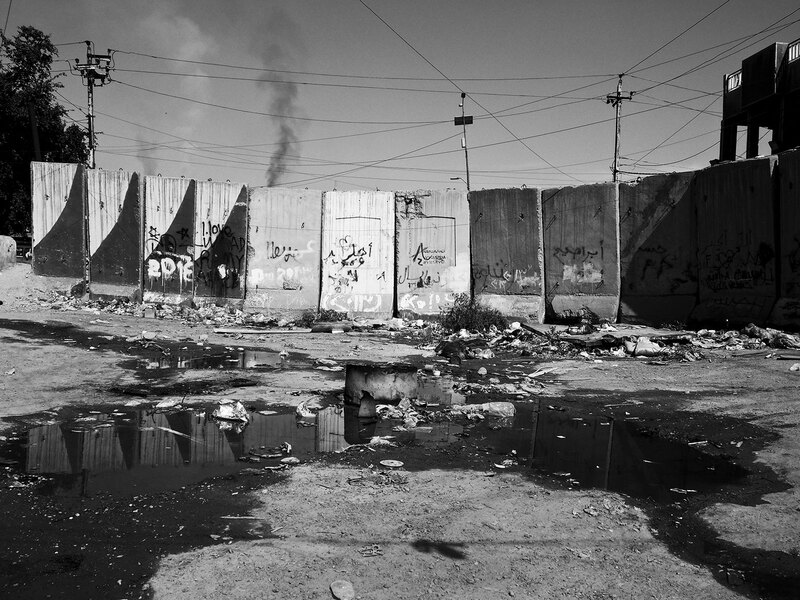 Moises Saman has contributed to the New York Times, Time, and Human Rights Watch.